This popular all-black flock is made using quality, hardwearing PVC and a soft velour surface upon which to sleep. This is a great bed where comfort and support are key to a restful night. 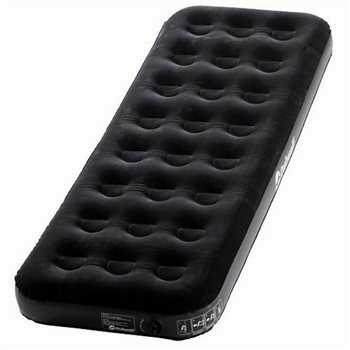 Purchased 2 of these airbeds as my daughter was having friends over and they worked a treat. They are sturdy and good quality. Also they are very easy to deflate and fold away afterwards for easy storage. Great buy. As a novice camper, I was delighted with this blow up bed. Well made, superb value and very speedy delivery. Very happy. Lovely single airbed, very comfortable. Great for sleepovers at home and camping trips. Very pleased. excellent my son used it for camping 2 weeks ago for four nights said it was very comfy.